Zillow's latest round of research reveals socio-economic, generational and racial gaps in housing. According to the study, black and Hispanic neighborhoods are disproportionately impacted by negative equity. The negative equity rate for black neighborhoods is 20 percent -- double that of the national average. The study also revealed the struggles that millennials and low-income earners face on the road to homeownership. As the overall U.S. housing market recovers, the economic and housing prospects for millennials, communities of color and the working poor are on life support, according to recent research by Zillow based on an analysis involving TransUnion outstanding mortgage debt data and homeowner Zestimates. The report noted that millennials are taking longer to become homeowners, black and Hispanic neighborhoods are disproportionately experiencing negative equity rates, and affordable housing is increasingly becoming out of reach for the bottom third of income earners. These topics were at the forefront of the company’s economic forum that took place Jan. 11 in Washington, D.C.
“Our research on housing has unlocked issues that are closely linked to broader social and economic problems in the U.S. — such as poor access to credit, weak income growth, and social mobility,” said Zillow Chief Economist Dr. Svenja Gudell in a statement. When it comes to the lower-than-expected homeownership rates of millennials, some posit the group simply have a serious case of wanderlust that makes becoming an owner unattractive. But, Zillow’s latest Housing Confidence Index, along with research from other, outside entities, shows that’s far from the truth — millennials views on homeownership and the American Dream is similar to that of their parents and grandparents. According to Zillow, older millennials (aged 26 to 34) were scarred by the recession and didn’t get the expected return on investment on their high-priced degrees, which pushed them to move back home with parents or stick with renting. Furthermore, data show that while first-time buyers’ average incomes haven’t significantly changed, the median price of a starter home has increased by approximately 25 percent. Over the course of 2016, the housing market faced quite a few stubborn roadblocks, namely low inventory and skyrocketing home prices across the nation. Although rising home prices are a thorn in the side of any homebuyer, Zillow’s housing data showed that the bottom third of earners spend twice as much of their income on mortgage payments than the top third of earners. That fact holds true even when these earners choose the cheapest housing available. This trend, unfortunately, creates a vicious cycle for those with low incomes. Many of the jobs and opportunities that would allow them to experience socio-economic growth are in high-priced urban areas, areas they can’t simply afford to live in. Finally, low-income earners were acutely impacted by the housing crisis — the cheapest homes were the most likely to be foreclosed upon, thereby forcing them to become renters. When it comes to housing, color literally matters. Zillow’s Report on Consumer Housing Trends showed that homeowners are disproportionately white and college-educated. On the other hand, the homeownership rates for black Americans has consistently lagged behind the national average for the past 100 years. This is due, in part, to the fact that blacks are denied home loans at a much higher rate than their white, Asian or Hispanic counterparts. Those who make it to homeownership face another set of issues — namely negative equity. Homeowners in predominately black communities are twice as likely to be underwater on their homes, which means they owe more than what the home is actually worth. The negative equity rate in black neighborhoods is 20 percent — double the national rate of 10.9 percent. Hispanic neighborhoods are fairing a little better, but still behind, at a rate of 12 percent. In contrast, the rate white neighborhoods is at 9.9 percent. The negative equity rate increases in urban black neighborhoods in metros such as Chicago, Detroit and St. Louis. For example, the rate in Chicago is 28.2 percent — 8.2 percentage points higher than the national average for black neighborhoods. “Negative equity is not an equal opportunity offender, with certain markets still being more affected than others,” said Gudell in a press release. To calculate the negative equity rate by race, Zillow used its Zestimates for homes in its database, matching homeowner names as registered with the county with outstanding mortgage debt reported to the TransUnion credit management company. Zillow computed equity as the difference between the estimated home value and the sum of all mortgage debt. The company then compared ZIP code-level data with U.S. Census tracts in which homeowners of a given race represented the majority of homeowners in that given area. Tracts that had no majority were labeled as “mixed” (or “no majority”) in the output, which was treated it as its own racial group. 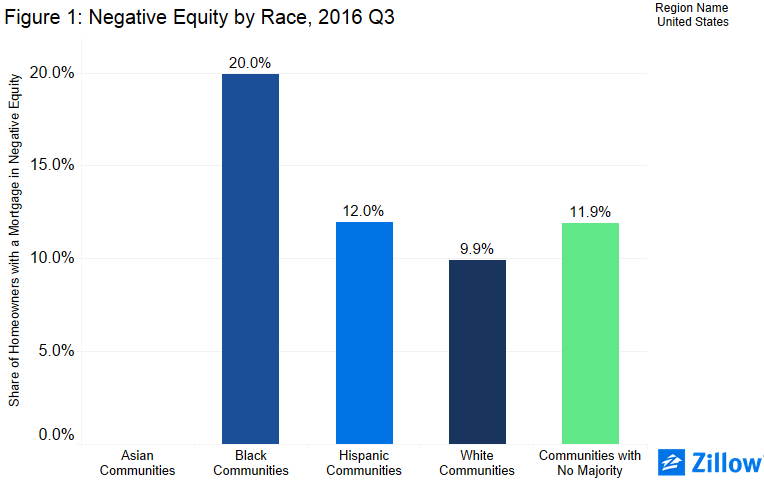 Negative equity by race was computed at the national, metro, county and state levels.